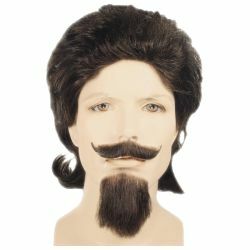 This Buffalo Bill wig includes only the wig, the goatee beard and moustache are sold separately. The wig features an elastic band for a comfortable and secure fit to almost any head size and is available in a wide range of colors. This wig is styled to recreate the look of the famous western performer, Buffalo Bill. It it used by our directors who a directing the show Annie Get Your Gun. Wig is available in black, dark brown, light gray, medium blonde, medium brown, or medium gray.